Save time and money at the grocery store with Candice Kumai's healthy eating tips that will make the clean eating diet easy for the whole family. Save time, money and calories by making your own fresh marinades, sauces, dressings and soups at home. Most likely, you already have everything you need to make fresh dressings right in your pantry. An arsenal of olive oils, herbs, spices and staples like Dijon and apple cider vinegar are all it takes to make hundreds of dressings. The more spinach, arugula or mixed greens you purchase, the more savings you’ll find. Excess greens can be blended into juices and smoothies, whizzed in fresh pesto or tossed into soups, on top of pizzas and into grain salads. Get Candice Kumai&apos;s recipe forLight Almond Pesto Pasta. Sometimes it’s not just about savings. I’m totally okay with spending a bit more on my fresh, organic produce because I’ve always kept the mantra that health is wealth. Fresh organic produce is full of nutrients, contributes to healthier soils, uses less pesticides (better for us and our planet) and truly does taste better than conventional produce. See also"What is Organic Farming, really?" I buy all my grains and seeds, such as oats, barley, amaranth and quinoa, in bulk. I also save serious cash buying my flour, dark chocolate chips and coconut sugar in bulk stores. Remember that what’s in season is what’s in style, so shop for what’s on sale and in season at your local grocer, or hop to your local farmers’ market and go for the best deals possible. Play Top Chef and cook an experimental meal based on the ingredients you purchase that day. When shopping in season, you’ll also get the produce at its peak in flavor, color and nutrients. 'Tis a new year of wellness and the season to change, refresh and clean up your whole life! The new year can also be a magical time to be inspired by other unique and healthy cultures. Joy McCarthy, holistic nutritionist and author of Joyous Health: Eat and Live Well Without Dieting, explains why eating clean will make you glow from the inside out and fill your days with abundant energy and happiness. With a click of her heels, "Stiletto Chef" — and fashion industry vet — Candice Kumai turns healthy eating into something simple and stylish, not to mention budget-friendly. Chef Michael Smith talks food, family, time-saving tips and a very versatile legume: lentil! 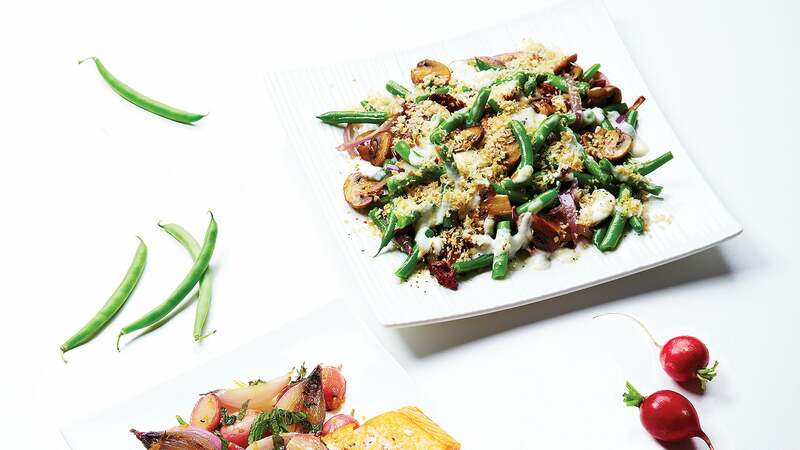 Clean Eating's latest Chez Chef, Sonja Finn, chef and owner of Pittsburgh Pennsylvania's popular restaurant Dinette, offers her top tips that will help you enhance the flavors of any dish.